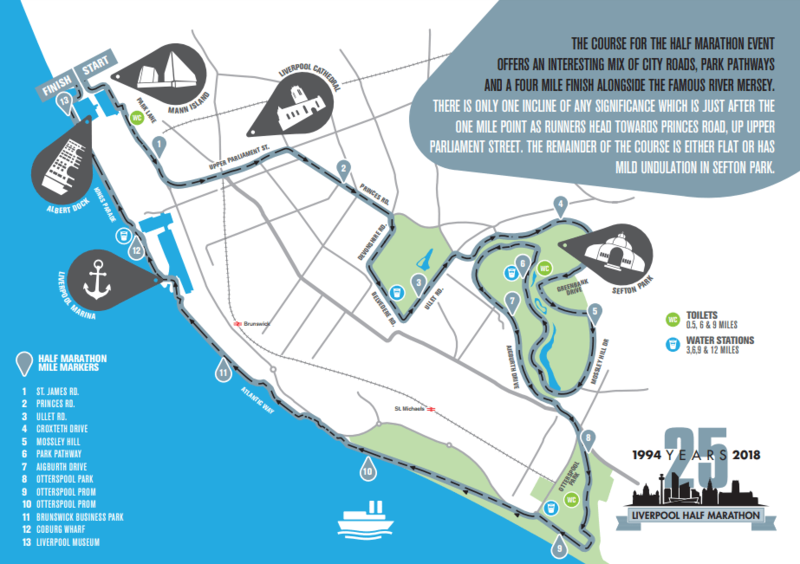 Race in Liverpool's most historic road race on this scenic course along the River Mersey. This race will attract all runners and is a big event in the city. Come for the finisher's medal and kick your feet up with a bite to eat and drink after the race. Welcome to the Liverpool 10 Miler which is being run alongside the BTR Liverpool Half Marathon. As many of you may know the Liverpool Half Marathon is the longest established road race in the city and a new race distance of 10 miles was introduced to encourage 10K runners and perhaps some less experienced runners to try an intermediate distance on the way to a half marathon. It has proved more than popular with both previous years being sold out. Predominantly flat with an incline just after the 1 mile point at Upper Parliament Street of around 3/4 of a mile and then a run through Princes Road turning on Ullet Road just after 3 miles. At Sefton Park runners can enjoy the natural beauty of the park taking in both the external roads and internal park pathways. It is predominantly flat with a short, sharp incline just after the 1 mile point at Upper Parliament Street and a run along Princes Road, Devonshire Road, Belvidere Road and then a right turn off Ullet Road toward Sefton Park, after a short distance on Aigburth Drive, runners will make a U-turn and continue down Aigburth Drive in the opposite direction before rejoining the Half Marathon runners at the bottom of the park. The nearest main line train station is Lime Street which is a 20 minute walk from the start area. The nearest local train station is James Street on the Liverpool loop line. It is possible to get the loop line train from Lime Street to James Street which is a matter of yards from the start area. The waterfront roads are well signposted from any direction when approaching the city centre Follow city centre signs or the brown Tourist signs for Albert Dock. From the north, the Liver Buildings can be found on the right hand side of the road just after the Radisson Blu Hotel at Leeds Street, Old Hall Street, Great Howard Street junction. From the south, follow the signs into the city and look out for Albert Dock, Liverpool Arena and Liverpool ONE shopping centre. The Liver Buildings will be on your left just after these locations. From the east, (M62 / Edge Lane) follow city centre signs all the way into the city itself and two main roads will take you to the Liver Buildings via London Road, Churchill Way flyover, Dale Street and Water Street OR via Islington, Hunter Street, Scotland Road and Leeds Street to the Radisson Blu Hotel. The Liver Buildings is on your right hand side just after this location. From Wirral / Kingsway (Wallasey) Tunnel, exit onto Scotland Road towards the city centre and follow the right hand turn at the first main set of traffic lights (after exiting) onto Leeds Street. Follow this road to the waterfront area just after the Radisson Blu Hotel which will be on your left hand side. From Wirral / Queensway (Birkenhead) Tunnel, turn immediately left upon exiting the tunnel and follow Dale Street as far as Water Street past the Town Hall. Turn left here onto the one way system and move across to the right hand lane to undertake a natural u-turn where you will head north toward the designated car parks. Nearest car parks – two locations at Princes Dock (next to the Malmaison hotel) and Capital car park next to the Thistle Hotel are within walking distance (400 yards) to the start / finish area in front of the Liver Buildings.Both offer reduced all day parking rates on Sunday. Can I defer my entry or request a refund? No. Once your entry is accepted (save for statutory rights for online payments) it is not possible to transfer / defer entries or arrange entry transfers. How old do you need to be to enter? As the race is held under UKA License, the age limit for entries is 17 years on race day. Yes you can. There is no obligation for you to do so as a condition of entry but you are welcome to fund raise if you wish. Yes. Everyone who completes the course on the day will receive a medal and a technical T shirt. Yes it is. As the event is staged under UKA License the course is accurate to 13.1 miles and has a UKA Course Measure Certificate confirming the accuracy of the course. The closing date for entries is normally two weeks before race date. Entries will remain open for longer if numbers are available. If entries are available during the last two weeks then the online facility will remain in place. If not it will clearly state ENTRIES CLOSED. Entries will still be taken during the last two weeks (if available) but NOT posted out due to the inconsistent nature of Royal Mail deliveries. If you enter during the last two weeks then you can collect your race pack in person from the event office or on race morning. Is there a cut-off time to finish? Normally there would be a time of 3 hours to complete the course but as the last four miles are off the public highway with runners returning along the promenade, it is not imposed. It should be noted however that the Marina access bridge at approximately 11.5 miles will be in operation from around midday to allow yacht craft out on the river. This may impede you if you have not crossed this location within 3 hours. Well organised event, fairly flat apart from an incline around 1 mile. Apart from that I found the course mainly flat with slight downhill parts. Hard going on the pier front if it's a windy day! Would highly recommend this race, I've ran numerous half marathons and 10K but this one was my favourite. Well organised, once the hill, parliament St, out of the way its a nice course, but if bad weather like today the prom is a nightmare, overall good day. Despite this being called the Liverpool Landmarks Half i dont really see what significant landmarks it takes in. Undoubtedly its a fast course withbthe onky real hill being 650m up Upper Parliament street. Enjoyed the section around Sefton park and down to Otterspool. My main criticisms are tegarding organisation. It was a wet day and nowhere for anyone to shelter apart from on the baggage buses. If you had a bag you just dumped it - nowhere to leave it safely, or ticket for collection. Just plonk it on any bus, anywhere and try to remember where it was. I like the medal but the t-shirts may as well have been one size. The queues at the end for drinks and snacks were ridiculous. I applaud the idea of no plastic waste but other events manage to give out end of race stuff far more slickly. I wont be doing this race again - there are so many better ones to chose from. First time running BTR Liverpool Landmarks Half. Ran Liverpool Rock n Roll Half last year which has some similar sections so knew what to expect. Good mixture of urban, park and the prom. Race number was posted out well in advance with an excellent information sheet provided. Being city centre location no issues with parking. Loads of portaloos by the start line so no issues with queues. Was a fairly large field so quite congested at the start until the joy of the climb up upper parliament street hit us after the first mile which started to thin the field out a bit. Weather was not the best and with 50mph winds the four mile stretch along the prom was a challenge in itself. Plenty of water stations and great support from marshals throughout the course. Some good sections of crowd support thrown in despite it being a grim day. Cost was £33.50 which got you a great medal, tech tee shirt, water, canned drink, banana, crisps, energy bar. Well organised event which I would definitely do again. Ran the 2019 race with my wife having done so back in 2017. I love the vibe of this event, great atmosphere at the build up, plenty of porta loos, loads of easily accessible baggage buses - well organised. The route itself is decent, not being a liverpudlian I'm not well knowledgeable on the local area but I love this route. It's certainly not flat but all the elevations are fair ie you get back what you put in. Afterwards you are looked after well with a t-shirt, medal and various goodies, the finish area is good with good atmosphere. There are decent little pockets of support around the course but not great however in 2019 that would have been done to the horrendous weather!!! The last 4.5 miles of the route should be beautiful running along the Mersey front, however we where met by 55 mph wind this year which I literally saw side swipe someone off their feet! Nothing the organisers could do but the weather this year was absolutely dire - torrential rain before and during for large parts and the aforementioned violent winds made a PB near enough impossible! However, the organiser could control something and I have a big criticism here, there is a 10 mile race within the half marathon, and this results in some awkward situations. The faster runners at the half marathon catch up to the part of the course where the 10 mile runners are on. But the trouble is you might have runners at 6:30 a mile pace trying to pass runners at 12 minute a mile pace, in some sections where the path is narrow, and when you get some social Sharon's going 4 in a line with no respect for quicker runners, giving you verbals for trying to get by then you know there's an issue. It doesn't work for me I'm afraid. Still a good race though and I'll recommend it! It was a very cold and blustery day but the course was well marsheled and considering the conditions alot if support at the start/finish line. Fairly flat course. Hi are there any changing facilities or showers available after the race. Travelling from Birmingham for this. Cheers. Hi there. Just to let you know there are changing facilities and showers, however these need to be booked in advance. Full details should have been provided in the race instructions which were sent out - please feel free to contact us at [email protected] if there's anything else we can help with! Hi there. There will be pacers for the following times: 1:30, 1:40, 1:50, 2:00, 2:10, 2:20 & 2:30. Good luck! Hi there. Just to let you know that you will receive an awesome medal on completion of this event. Good luck! Can you enter on the day please????? Hi there. Just to let you know that you can't enter on the day, and to avoid disappointment, we would recommend entering ASAP as it's a very popular event. Best of luck!